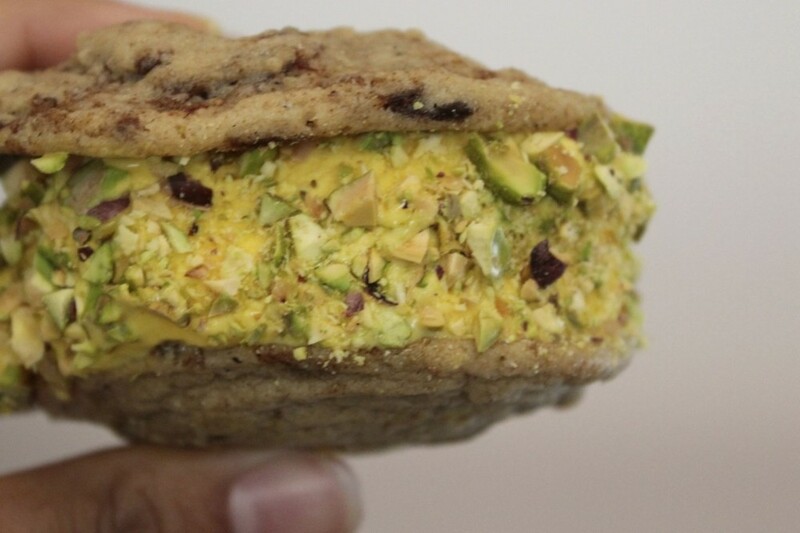 This East Meets West ice cream cookie sandwich will knock your flip flops off. The date and cardamom cookies are perfectly chewy, the saffron ice cream is rich and creamy and the pistachios add the perfect crunch. You will need to hide these from the cookie lover in your life, my husband almost finished the whole batch before I could make my ice cream cookie sandwich. I had to scream at him like he stole something to make him stop. Then things got very awkward between us, but that's another story. Once you've made everything, and managed to keep people away from the ice cream and cookies, assemble the sandwich. It's so simple I feel like I'm insulting your intelligence by even describing it to you. 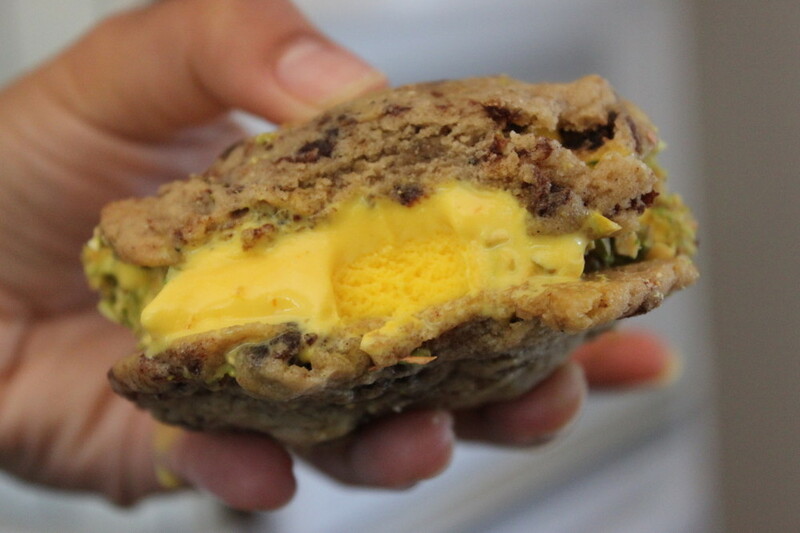 Top it with another cookie and then roll the ice cream edges in the pistachios. If they don't stick, just sprinkle them on and gently push them into the ice cream. I sacrificed myself for the cause. 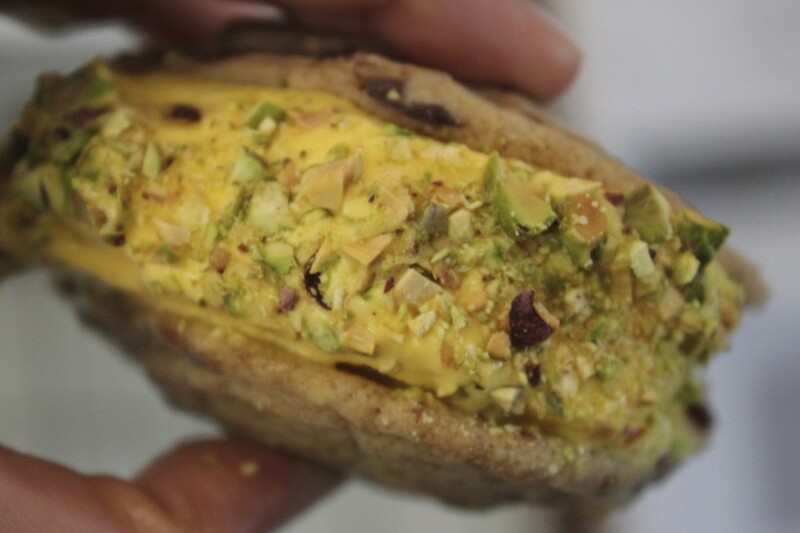 Scoop the saffron ice cream onto an upside down cookie. Top with the other cookie (right side up), and gently push down. Roll the edges of the ice cream into the pistachios, if they don't stick all the way sprinkle and gently push the pistachios onto the ice cream. Take a bite and grab a napkin, it's a messy job but somebody has to do it!